’cause they all belong to me. but it’s too late now, you see. don’t ask me to go. In truth, Siri (who I fondly call “Seaweed”) is the sweetest and most trusting cat that we have ever had. We adopted her from the Siamese Cat Rescue Center a year and a half ago. She was found taped up in a box with several other kittens, with only 5 small holes punched in the top for air. She could have died in there. If a human had been that cruel to me, I would never have trusted another person again. But Siri has totally forgiven the world for any unkindness that she endured. It is the middle of the night and she is lying right here—watching out for me. 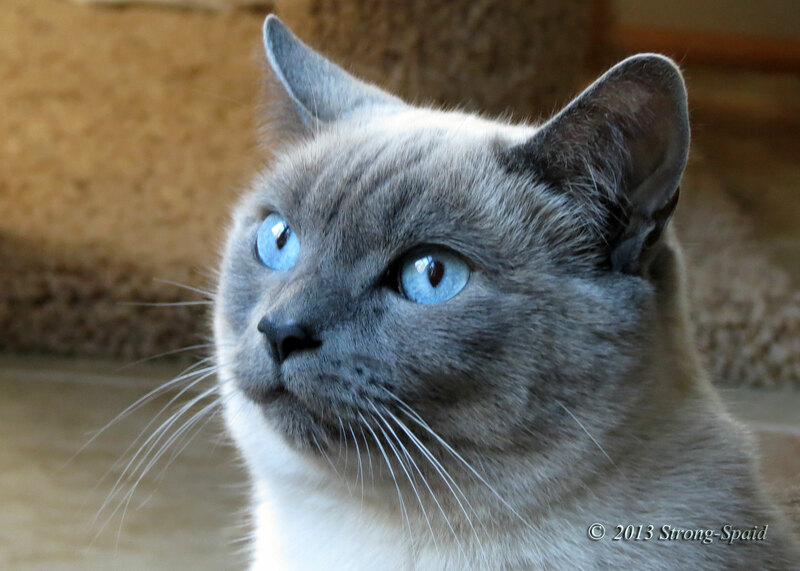 This entry was posted in cats, Haiku, Pets, Photo Essay, photography and tagged animals, Humor, poetry, Siamese Cat Rescue Center. Bookmark the permalink. Cushions of blue—like Siri’s eyes! Her color for sure!! The little lady has style, for sure! Me too! I wish there were more happy beginnings and endings in the world…. I will tell her that you called her a cutie. If I had 4 cats, I would probably never see the computer monitor or my keyboard again! And the cats cannot deny that they do this, because I have proof. Lol, yes typical cat. I just love their personalities..
Seaweed is a real beauty and deserves all the seats in the house. She is special for sure, and so are you. II have a rescue dog. I think they know and forgive. I hope the other kittens were rescued too. This is a lovely post. I hope the others were rescued too! Siri has already tried every seat in the house at least once. Thanks! She does have the most interesting eyes! Lovely! I like that she takes over two! My Harry also takes over the kitchen chair, the computer chair, the back of the loveseat, the extra pillow on the bed, his own pillow on the quilting table, . . . yep, I guess they are pretty much all his! Yes….somehow everything ends up belonging to the cat! 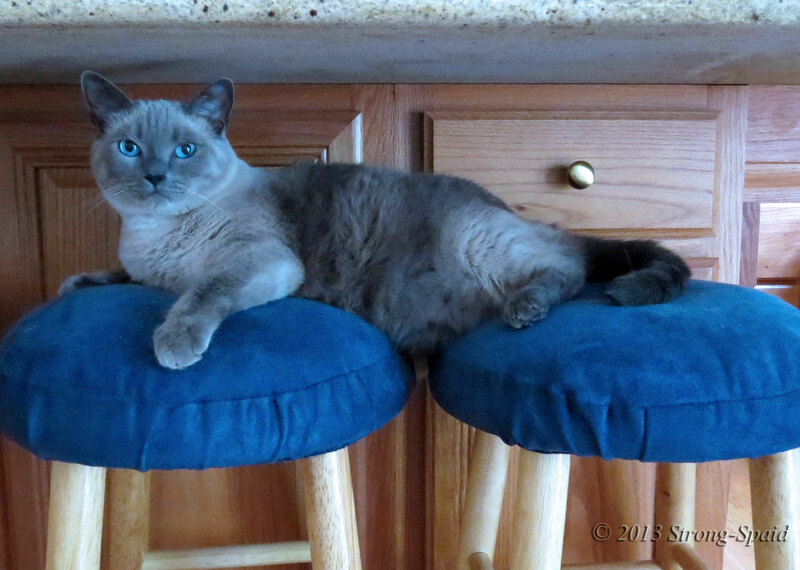 That look is so Cat… it simply says: “I’m sitting on TWO chairs because I CAN” – love the picture!! Beautiful cat. Is she Siamese or Burmese? She is a Bluepoint Siamese. There was a third chair there also….I’m surprised she didn’t try to stretch out a little farther and claim that one too! What a beautiful cat! Thanks for giving her a forever home! Thanks John! At this point, I don’t think she remembers being anywhere else. Definitely a forever (fur-ever) home. She’s pretty healthy. Maybe she will live as long as yours did. Thanks for the wish! Wow – she is absolutely beautiful! I adore cats! Thanks! I’ll be sure to tell her….Siri will love your compliment! I’ll do that! She’ll love it. And yes, it would be nice if humans could learn to be that forgiving. Don’t know if that is ever going to happen though. No question about that….they definitely take over. Always a dog person, but love your cats and cat stories, Mary! Is Fortune Cookie male or female?